"Have fun with cute LINE characters! A great combination of RPG and defense! LINE Rangers!" Alien troops kidnapped Sally! Go rescue her! 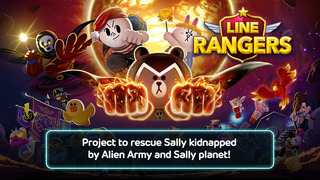 To rescue LINE's cutiepie, Sally, her friends in LINE Town transformed into Rangers! With the Rangers, defeat the alien troops and save Sally and Yellow Planet! You will, right? You can meet many different LINE friends including original characters like Brown, Cony, Moon, and James! Create your own team of Rangers with over 400 cute characters! Join a battle with your Rangers or combine them to level them up! Gather evolution materials in special stages to increase your Rangers' grades! Level up your Rangers and help them evolve! They will become more powerful than ever! Get weapons, armor, and accessories with a variety of stats and equip your Rangers with them! Enhance and reinforce your gear to make it more powerful. 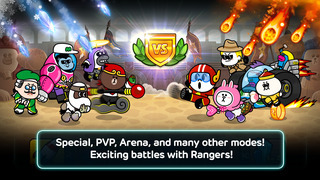 Enjoy many different types of battle in LINE Rangers! If the battle is too hard, summon a friend to get help! You can get more help from other guild members if you join a guild! Enjoy guild activities with friends! You can enjoy guild raids with other guild members and also enjoy various guild benefits!